This was my 6th Pioneer race, having done it every year except one since I began doing Island Race Series races back in 2006. While I have raced fairly well here a number of times, I have found that coming so soon after the holiday season makes it a tough one. Last year I ran a pretty solid race to PB in 26:19. Based on my strong fall race season, I was hoping to improve on this a bit with a sub 26 min as my goal (3:15 per km pace). This year Sonja and I arrived early as we were both volunteering and I was kept busy helping with parking until around 10:25am. It was then a bit of a rush to hit the bathrooms and get a 10 min warm up in. I made it to the start line with with only 45s to spare so that was cutting it just a bit too close for comfort. Bob Reid was announcing as usual at this race as it is a Prairie Inn Harriers hosted event. It is great to have such a veteran at the mic as Bob knows so many runners in the community and beyond. The first kilometer of this race is super fast since it is all downhill and I clocked a 3:01. I had settled into about 10th place and was running near Ben Brzezynski. I was feeling decent and felt that if I could run a similar race in terms of relative pacing as I did in 2011 I should be able to sneak in under 26 min. The 2nd km was flat so my time here should have been close to my overall goal of 3:15 pace, but I was a bit fast at 3:09. I eased off a bit, knowing there was plenty of race left. I did work the uphill through Brentwood Bay pretty well gaining on Ben and eventually catching and passing him around the 3km mark. Still feeling decent, I hit the halfway mat at 12:49, which gave me a buffer of around 20s get under 26min. Knowing that the 2nd half was more difficult than the first, I knew I would need it. 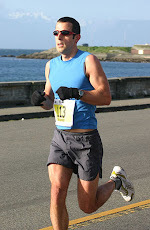 When I saw my next split of 3:20 on a km that should have been fairly fast, I had the first idea that I was in trouble. Over the next km, Ben passed me back again as I struggled to maintain my rhythm and Ian Hallam cruised by me soon after that. I couldn't respond. This km was up a gradual hill and has generally been the slowest of the race for me, but it was still disappointing to be fading. The next split was a shockingly slow 3:40 which was even more discouraging - I knew for sure a PB was not going to happen - let alone a sub 26 min race. I did find out after the race that the turn around was placed too far out, increasing the course length by about 75 metres. I estimate that it cost be about 15s, which would seem about consistent with what it felt like I was running at that point (3:25). A few hundred metres before the 7km marker, Nick Walker passed me seemingly moving pretty well. Again, I wanted to respond, but just didn't have the ability to do so both physically and mentally. 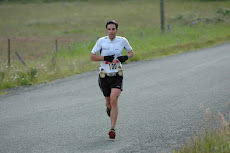 I gutted out the last km, knowing that I was not moving that well, but not wanted to lose anymore positions. Luckily, Shawn Nelson was still too far behind to catch me. This year race organizers had added a timing mat 100m before the finish line so that everyone could now contend for a Green Jersey sprint award. Generally, I have an acceptable sprint, but not this time, I was just happy to get to the finish line. I finished in 26:48 good for 11th place and first in the M35 category, below my expectations even if you take off the 15s for the longer course. It was the first time since I started running these races that I have not posted a better time at particular race, year over year. I knew the day would come when this would happen, but I hadn't expected it quite so soon. Congrats to Steve Osaduik for taking the win in 24:46 and Lucy Smith the woman's win in 28:30. Kudos also to Larry Nylen for a PB (despite the long course) and Claire Morgan who ran here 2nd best IRS race based on points. While disappointing, this race was not my focus for this year so I'll move forward continue training hard and hopefully run better next time. On the plus side, I felt pretty good on the 12k run I did after the race. 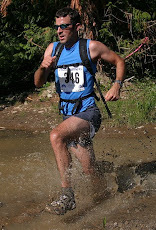 Qualify for the 2011 World Mountain Running Championships in Albania. This requires that I run exceptionally well at the Canadian Mountain Running Championships in Canmore Alberta so I have a chance to be selected for the Canadian Team. Completed - placed 5th at Canmore to grab the last automatic spot on the team. To achieve my primary goal, I will need to do as much hill work as my legs will take and race as many hilly trail races as I can fit in. Some of the trail races that I already have plans to do are the Dirty Duo 25K, 4 or 5 Gutbusters (the schedule has not been posted yet), and Kusam Klimb. Prepared well with lots of hill workouts and racing at Dirty Duo and Mt Tzouhalem Gutbusters. Kusam was unfortunately cancelled. If I could also set a few more personal bests in road races (I'm planning on doing 5 or 6 island race series races) that would be icing on the cake Set PB's for every road distance raced this year except the half marathon. Ran better than expected. Throw in an adventure race or two to keep things interesting. I'm also keen to try a 24-36 hour adventure race and/or a 24 rogane if I can fit them in. Did two MOMARs, but unfortunately did not manage any other new races. Start coaching a few more runners and help them achieve their goals. Currently have 4 people I produce a full program four and another group who regularly drops in to Thursday sessions. I've been quite happy coaching and plan to continue. Stay (mostly) injury free. Was generally healthy although I have been battling a mild groin injury for a number of months. I'd say that I did well in reaching my goals. Some other Positives for 2011 include. Of course is wasn't quite all rosy as there were still a couple of negatives for the year. Had a terrible race at the World Mountain Running Championships in Albania due mostly to the heat. It was unfortunate to race so poorly at the highest profile event I have even attended. 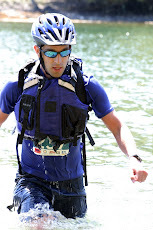 Do at least 1 adventure race. I'm also keen to try a 24-36 hour adventure race and/or a 24 rogane if I can fit them in. Continue coaching runners to help them achieve their goals. Perhaps add a couple more athletes. Lets hope 2012 turns out to be as successful at 2011 was.